We stay up late because we love late nights and silence, and rarely set the alarm. Except for Thursday mornings, when I wake early because I’m going to Dance. On the Mountain. In the studio that has windows, not mirrors, so you look inward or outward, not at your reflection. 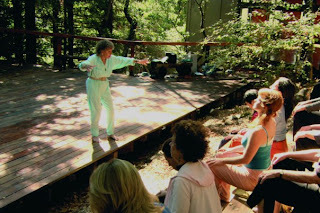 Or, if it’s nice, we dance on the extraordinary deck among the Redwoods, where Merce Cunningham was once photographed leaping across the length of it. Once I wanted to be a dancer, but there was that injury, and lost extension, and then there was rheumatoid arthritis at 30, and only being able to walk to the corner, (which is four doors away), and the slow build up to two miles each morning. The dance class begins with a long, slow, meditative warm-up on the heated floor, and there's the music - the music! Last rainy, blustery week the Mountain was hidden behind a low fog bank, and wisps of cloud were snarled among the trees, and then it poured, giving us another rhythm to dance to. Every week dance-mind and dance-body return to this aging one, but what is aging when your teacher is 90? 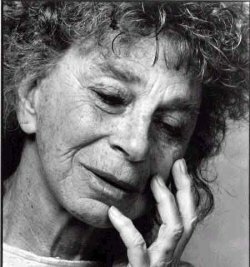 When I saw the film about Anna Halprin, Breath Made Visible; when I saw her dance the cancer out of her body, and dance Intensive Care after her husband had been there, and score the elderly in rocking chairs, I knew I would attend her Thursday morning class. "When I was a young girl, I danced to rebel! deer, the rolling hills, and the ocean. And when I will be eighty, I will seek to be a healer. And when I become ninety, I will dance the essence of things…"
Anna & Larry. If the 60s & 70s on the West Coast were about changing models and embracing change, alternative life styles, and facing the fact of race, who were more innovative than the Dancer and the Architect? Collaborating on new forms of community, new ways to integrate the public into what Lawrence Halprin was designing, new forms of response, public scores, and unpatterned dance, choreographed from inside out. After a workshop I once took with the Halprins, I realized that the basis of community was myth, symbol and ritual, and no class I ever taught (except perhaps for Logic, but that’s another story), was complete without that realization. I am not one who looks back to the 1960s and 70s with pure nostalgia, since I experienced the shadow side of that era, as well as its creative expressions. But I think, in these traumatic times, when expectation and possibility seem to be shrinking, that Anna’s work is like a silk ribbon extending from an era when the words ‘human’ and ‘potential’ were often uttered one after the other. underworlds to feed us blood and bone? Now I see, Leah! So dance is Mercurous itself, that which dissolves, and in so doing, makes possible new forms, even of that which cannot be borne as it is. I love that idea!Mercury/Hermes is of course the trickster, and in her dances that turned traditional ideas of dance upside down, Anna was certainly the trickster!